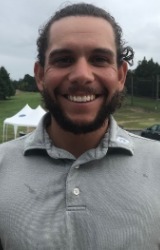 A happy Luke Toomey leads the $30,000 Platinum Homes DVS Pro-am at Sherwood Park in Whangarei after a seven under par round of 63. Toomey leads by one from Hayden Beard and Pieter Zwart with Lachie McDonald, Fraser Wilkin and Brad Shilton a further stroke back on 65. With 23 professionals at par or better it should be an exciting finish tomorrow.